This week's challenge at Humbug Hall is metallics and the theme is seasonal silver at Hazel's blog so I thought I'd combine the two. Apologies now for the quality of my photo but Picasa is playing up!! 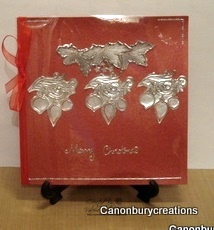 I used a red pearlescent base card and made my metal embellishments using Debbi Moore's Metal Magic and a free stamp from Craft Stamper and a Jenny Mayes small one. I'm not good with metal sheets, although I've only tried with one type but I just kept cutting myself!!! Great card, love the look the metal magic. Oooooh fantastic. Thank you for sharing with us at Bah! Humbug!